Introduction: On 16 April 1945, the Soviet first Belorussian Front launched the offensive to take Berlin from its positions along the Oder river. The outcome, however, was not the foregone conclusion that Stavka had hoped as the Germans fought with a fanatical desperation as the Red Army neared its objective. In this scenario we are in the last stage of the war (sure you already noted that before i said), so we will be using the better equipment available in the war, and that represents a problem for the German and Russian army, and is that the equipment is matched, so you are not going to rely in a special kind of unit/s to take advantage, you will have to take the advantage with the tactics you use. I prefer, in this kind of scenarios, to forget some of my key positions in order to get better atack positions and destroy the enemys most powerfull equipment, so he then can only throw to the battlefield his weaker one and i can move freely anywhere, since this poor equipment cant match mine. Based in this tactical theory i mentioned, i made a battleplan for defending Berlin. You can see in the map, areas called A, B and C. The A area is where the germans must concentrate the bulk of its better equipment to face the advancing soviet army. You can see yellow arrows too indicating from which positions is that you must reinforce the areas. Then in order of importance, follows B area. 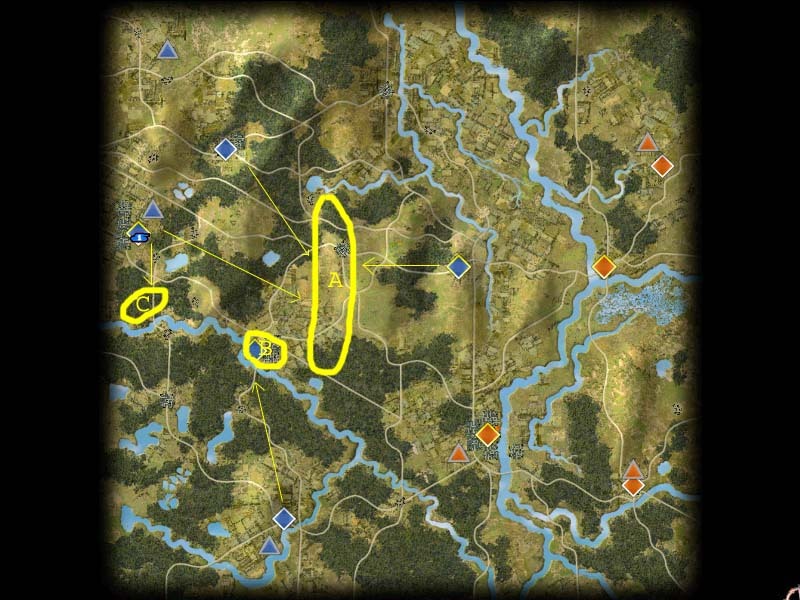 B area will protect any russian atack from your Southern flank, so group A can concentrate in the middle region of the map. C area must be guarded only with the most poor units, cause it is a secondary defensive position. You will understand why i tell you this in a moment. You may be wondering now......why this plan?....why leaving Seealow free to russian ocupation and run behind were i am geting short of space to maneouver?. Well, thinking about this facts is that i choose this tactic. First.....The city of Seelow will recieve in the first 2 turns the bulk of the Russian army groups heading from it´s both key citys, so trying to defend this position with the good equipment the AI deploys in that area is only a truly waste of valuable militray equipment. So as soon as posible, units from the Seelow area must start moving to the meeting point in A area. If the Russian player opt to make some flanking maneouvers with medium army groups along the map, then you must be sure that none of them will have even the oportunity to atack before you totaly destroy it with the army group located in A area. From A area you..first.....wait for the first russian wave coming from seelow (the russian player may be probably using 2 or 3 army groups, so group A will face only one of them, surely the most powerfull one). After you destroy that group, well, you are close enough from your other occupied points to mount an atack (if the russian tries to flank you with the other small groups) in no more than 2 turns, so we can say that the russian will not have any chance against you since the moment you destroy his main group, so any soil you leaved to him before, can be easily taken back shortly and with a high price in lost units for the russians. In this kind of tactic it doesn´t matter how many citys you loose if you manage to keep at least one of you key ones. I forgot to mention another benefit of this tactic, and is that if you loose any unit in battle, then you can bring inmediatly to to the fight new ones since you are close from your deployment points, while the russian player is far away form his ones. Till the moment, this tactic has alwas been succesfull to me. To give you a better idea of the Russian most common behaviour in this map i made a graphic. Then you will see more clearly why this tactic is my favourite one. Well, i hope you all find this article of some use for next battles for Berlin.